Ever wonder why despite little innovation and being bashed by critics over the years, light-gun games still remain in production? It is because the logic required to play light gun games is not based on the mechanics of typical video games (joysticks, combos, and CGI). It's based on the understanding of firearms and in a country that has the right to bear arms "guaranteed" in its Constitution , guns predictably dominate our landscape, consciousness, and culture. Take my wife (the unskilled gamer she is), for example, who tried her hand at Soul Calibur and was frustrated beyond belief at the extensive techniques. But when I put a light-gun in her hand, she skillfully laid waste to a couple of zombies like an old pro. Shooting games, as well as racing and sports games, have represented mainstream gaming long before Myst ruled the sales charts. It stands as a source of social commentary on how easy it is for anyone to pick up a gun and fire away. It's no surprise that with the coming of the Sega Dreamcast a new light-gun game bearing the House Of The Dead name would be available in its budding library to appeal to this particular sector of the game market. 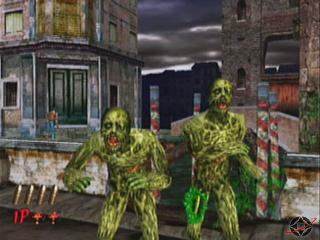 The home version of House Of The Dead 2 is a near-perfect console port of Sega's popular arcade zombie shooting franchise. As far as light-gun shooters go today, it is as straight forward as it gets. You won't find heated two player head-to-head competition like in Point Blank, no ducking feature like in Time Crisis, or any attribute buildups like in Elemental Gearbots. What you do get is an endless array of zombies, monsters, and creatures to be wiped out with extreme prejudice while being automatically guided through the stages like in an amusement park ride. There are also helpless civilians who often need to you to save them from the walking undead and a multitude of branching paths that can be chosen by the player to keep things interesting. 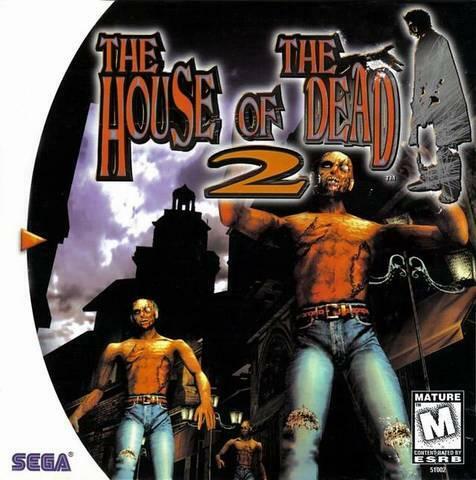 Even though it lacks depth like every other House of the Dead title, House Of The Dead 2 remains somewhat addictive, especially with the introduction of the exclusive "Original" mode. This mode allows players to take along either one or two items, weapons, or power-ups at the beginning of the game. Different weapons and items are earned from previous passes through the game and adds varying levels of replayability to the dedicated or obsessive gamer. While this is an enjoyable mode, it can be a challenge to discover the right combination of items to bring along and still be effective within the game. The classic "Arcade" mode removes this obstacle and plays parallel with the original coin-op experience. Next is the "Boss" mode, which allows you to do battle with only the main bosses and, lastly, the uncompromisingly tough and self-explanatory "Training" mode. Graphically, House Of The Dead 2 does a good job of displaying the processing power of the Sega Dreamcast. The environments are varied and convey a sense of being in a horror movie. The amount of enemies are diverse and well distinguished by good character design and animate smoothly with only a slight bit of slowdown. Audio is not on the same level as the visuals. The sound effects work well and the in-game music is actually quite nice. 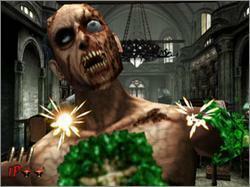 However, the real sore spot is the horrid voice-acting and script that appear during cut-scenes in between stages. Sounding like a cast of brainless robots, House Of The Dead 2's voice-acting sounds poorly made and ruins what would be an otherwise good overall package. It was so annoying, in fact, that I dropped the score down a half grade because of it. House Of The Dead 2 is well-crafted and a solid entry, but no one should go thinking that this is anything more than what it seemss to be. It is still, after all, a light-gun game in the traditional sense and designed to appeal to mainstream audiences, which means little thinking and plenty of shooting. Despite the alternative routes, this is still a very short game that won't require too many attempts before completion. All of this makes the game more of rental than a must own. For those who enjoy this sort of gun play like I do, House Of The Dead 2 will provide the expected bullet-riddled action with quality graphics on the surface. Those who never liked the genre to begin will be better served to just stay away as it offers nothing new to the tried and true on-rails shooter genre.